A. is paid for by the government. B. has zero opportunity cost in its supply. C. has a negative social cost. A. the market for the product clears. 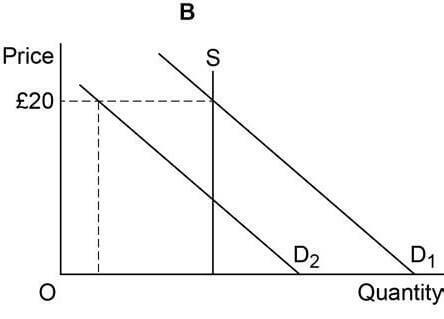 B. the price elasticity of demand equals the elasticity of supply. C. producers maximise their profits. D. positive excess demand equals negative supply. Answer: A- the market for the product clears. Q.3. 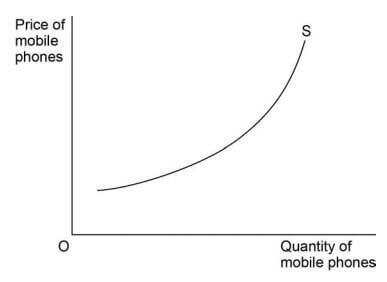 The diagram below illustrates the industry supply curve for mobile phones. A. the existence of a monopoly in the industry. B. higher prices providing a profit incentive for firms to expand production. C. the elasticity of supply exceeding the elasticity of demand for mobile phones. D. higher prices providing an incentive for firms to increase their productive efficiency. Answer: B- higher prices providing a profit incentive for firms to expand production. A. imposes a maximum price of above £50 per unit. B. sets a minimum price of £50 per unit. C. taxes the free market price. Answer: D- subsidizes the free market price. Q.5. The four diagrams below relate to the provision of medical services at a local hospital. The services are currently provided free. It has been suggested that patients could pay £20 each time they receive treatment at the hospital to reduce pressure on its fixed capacity and to reduce waiting times for treatment. 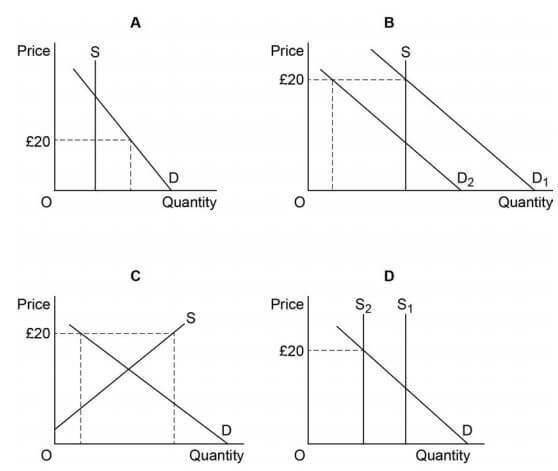 Which one of the diagrams, A, B, C or D, best illustrates the effects of such a policy? The supply of medical services is provided for free now (S), thus the demand for them is high (D1). The hospital now has decided to reduce the pressure on the fixed capacity its staff and also the waiting time for treatment, thus, they suggested that patients could pay £20 each time they receive treatment at the hospital. Due to this decision, now the cost of receiving medical services will go up, thus the demand will come down to D2, supply being constant. Q.6. The table below shows the private and external costs for four products. Which product, A, B, C or D, has a market price which takes least account of negative externalities? Answer: D: product D has market price which takes least account of negative externalities because the external cost per unit of output is highest in case of product D i.e. £8 per unit of output. Also, the share of external cost per unit of output from the total market price is highest. Q.7. Which one of the following provides a reason why governments should intervene in a market economy? A. Small firms are less efficient than large firm’s due to economies of scale. B. The existence of free riders will result in the overproduction of public goods. C. The social benefits of some private goods exceed the private benefits. D. Private firms are unable to produce merit goods in a free market. Answer: D- Private firms are unable to produce merit goods in a free market. Q.8. 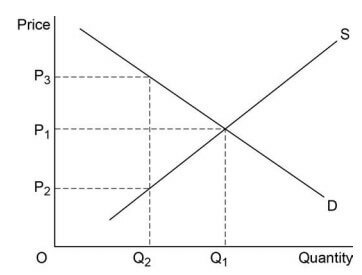 The diagram below illustrates the market demand (D) and market supply (S) curves for a good. The production of the good creates a negative externality. A. price ceiling of OP3. C. minimum price of OP2. Answer: B- tax of P2P3. Q.9. The table below shows possible sources of market failure in current UK markets. Which combination of example and policy, A, B, C or D, is consistent with the possible source of market failure identified? Answer: D- Negative production externalities arise from electricity generation like pollution etc. which leads to market failure. Thus, policy provision like pollution permits would help in correcting the market failure. Price elasticity of demand is percentage change in quantity demanded by percentage change in price. A. there are no free goods. B. there are no public goods. C. individuals must make choices. D. there has been a misallocation of resources. Q.12. 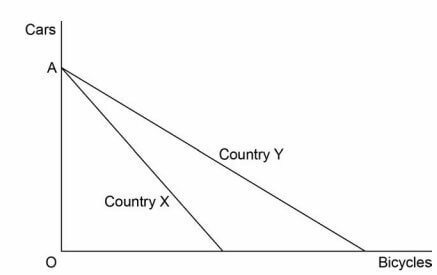 The diagram below shows the production possibility boundaries for Countries X and Y respectively. A. is greater for Country X than for Country Y. B. is greater for Country Y than for Country X.
C. increases as more cars are produced. D. increases as more bicycles are produced. Answer: B- is greater for Country Y than for Country X.
Q.13. The table below indicates the average price of furniture as a price index. Which one of the following can be deduced from the data above? A. The price of furniture rose throughout the whole period 2011 to 2015. B. Compared with 2015, the price of furniture was 20% cheaper in 2011. C. Revenue from the sale of furniture fell in 2014. D. Between 2013 and 2014, the price of furniture fell by 10%. Answer: B- Compared with 2015, the price of furniture was 20% cheaper in 2011. Q.14.Which one of the following is the most likely disadvantage that may arise from the growth in the size of a firm? Q.15. 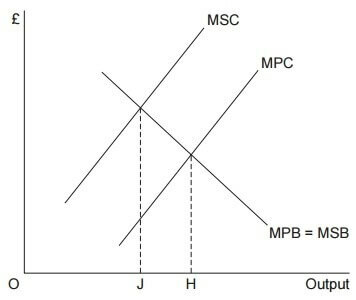 The diagram below shows the marginal private and social benefit (MPB and MSB) curves and the marginal private and social cost (MPC and MSC) curves for a good which generates negative externalities in production. A. there is underconsumption of JH. B. market output is too low. C. market price is too high. D. there is overproduction of JH. Answer: D- there is overproduction of JH. A. it is operating at the lowest point on its average cost curve. B. it cannot increase current production even if the demand for its products increases. C. output per worker cannot increase. D. an increase in production will decrease average costs. Answer: A- it is operating at the lowest point on its average cost curve. A. operate outside its production possibility boundary. B. increase the production of public goods. D. benefit from specialisation and the division of labour. Answer: C- prevents market failure. Q.18. The two diagrams below show the markets for Goods X and Y. Competitive demand is the demand for products that are competing for sales i.e. people can substitute one good for another. Here, demand for Good X increases thus, the demand for its substitute/competitor Good Y decreases. Q.19. Which one of the following combinations, A, B, C or D, is most likely to increase a firm’s monopoly power? Answer: A- Barriers to entry increase and product differentiation decrease. A. inversely related to price. A. there are negative externalities in production. B. the free market fails to provide sufficient merit goods. C. the free market underprices demerit goods. D. there is a missing market in the provision of public goods. Answer: D- there is a missing market in the provision of public goods. Answer: A- high and positive. Cross-price elasticity value is positive when the two goods are substitutes i.e. as the price of one good increase, the demand for the other good increases. Also, in case of close substitutes, the coefficient of cross price elasticity is high. A. technical and marketing economies of scale. B. purchasing and marketing economies of scale. C. financial and purchasing economies of scale. D. financial and technical economies of scale. Answer: A- technical and marketing economies of scale. A. an optimum allocation of resources can never be achieved. B. non-consumers benefit at the expense of consumers. C. an optimum allocation of resources can be achieved by placing a tax on the product. D. social benefits of consumption exceed social costs. Q.25. Which one of the following is most likely to be a reason for government failure?